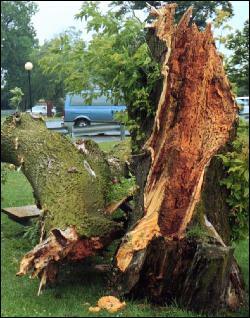 A risk tree rating system is essential to ensure that appropriate and reasonably consistent criteria are used to evaluate the relative hazard of a tree. Using a rating system allows for the systematic prioritization of risk tree removal and enables the development of realistic fiscal budgets needed for their removal. Many rating systems are available for use, based on the specific land-use or landscape setting. For example, the identification of potential hazard trees along a rural roadway is quite different that examining trees in a park picnic area. Methods and criteria for ranking risk trees are different in each setting, and the ability t accurately complete assessments in these locations varies in many ways. The method that you use to evaluate the condition of trees under your jurisdiction will be adapted to your specific situation. Several model evaluation and ranking protocols are provided here for your use. These represent only a baseline evaluation, and the forms should be modified to suite your specific setting and situation. Several model evaluation and ranking protocols are provided here for your use. These represent only a baseline evaluation, and the forms should be modified to suite your specific setting and situation.